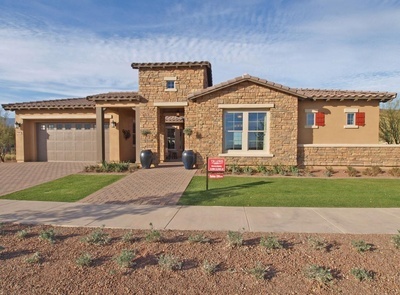 Welcome to Victory, the new active adult community in Verrado, Buckeye, AZ. The Victory District is in the NE corner of the Verrado community and nestled in the foothills of the Whitetank mountains. Construction is underway and the new home builders are, Lennar, Maracay, Standard Pacific, TW Lewis by David Weekley. Check out the HAVE FUN sign in the photos, as that is the new home of the Victory community center, pool, spa and restaurant. Be sure to check out the homebuilders and floor plans. Cal Atlantic Model Home with one of the most stunning views you will find of the White Tank Mountians. Located in Victory Verrado's model home complex The view has a combination of the White Tanks, driving range, golf course. A one of kind home with over $100,000 of upgrades in the home.A PUBLIC REPORT IS AVAILABLE ON THE STATE REAL ESTATE DEPARTMENT'S WEBSITE. A home that is perfect for multi-generational living or just for guests. The Next Gen Suite provides flexibility with a kitchenette, bedroom, bathroom and living space!A PUBLIC REPORT IS AVAILABLE ON THE STATE REAL ESTATE DEPARTMENT'S WEBSITE. Gorgeous Next Generation home with luxury upgrades. Upgraded kitchen in the main home with Electrolux appliances including the refrigerator. In the next generation suite upgraded kitchen that includes microwave, dishwasher, refrigerator and washer and dryer. Suite has separate entry to home. Upgraded flooring tile and carpet throughout home.A PUBLIC REPORT IS AVAILABLE ON THE STATE REAL ESTATE DEPARTMENT'S WEBSITE. 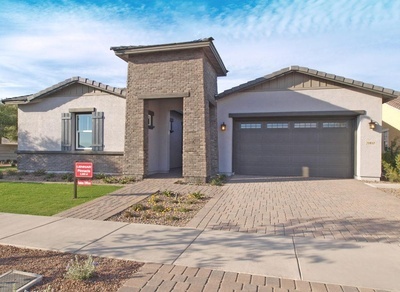 Thank you for visiting our web site today on Victory homes for sale at Verrado. Here you will find the most current city properties for sale listed on the MLS. To refine your home search, click on filters to change home price parameters or beds and bathrooms. You can also fine-tune the properties criteria by listing date or property status. This will give you the most recent listings to hit the market in city. If you have any concerns, please feel free to give us a call or fill out the contact form at the bottom of the page. Our local Verrado real estate agents would be happy to assist in any way they can. We are here to help and endeavor to earn our clients business by bringing local city knowledge and value. The home builders in Victory have been selected to create a set of unique and attractive floor plans for today's active adults, which really means that you are going to have some unique layouts and features to choose from. They will have some classic and contemporary styling, that will create a unique product in the Victory community, not available anywhere else. Because there are four builders, with home sizes ranging from 1800 to 3500 square feet, there will be something for everyone. With the new community center, wine bar, spa and Tom Lehman designed golf course, Victory will offer something that no other active adult community can match. You owe it to yourself to check it out. Be Sure To Check Out These Great Homes! It is important to be represented by your own Realtor, when buying new construction. You will NOT get a better deal by not having a Realtor. The salespeople at the builder only represent the builder. You will get a better deal by having your own representation in the transaction. But before talking to and registering with the builder, it is important to have your Realtor register you and work with you. Otherwise your Realtor cannot represent you. What Is My Home In Victory Worth In Today's Real Estate Market? The first phase of development is underway and is expected to include approximately 400 homes. 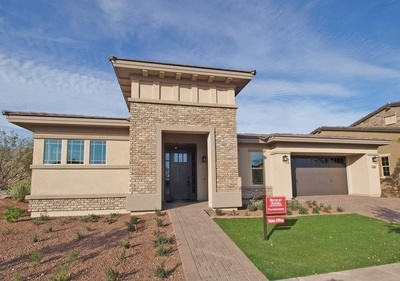 When this 1,200 acre community with-in Verrado is completed, there will be about 3,500 homes. All homes are being developed with the active adult in mind with low-maintenance exteriors, open layouts, and outdoor spaces for entertaining. Decorated and furnished model homes are now available to view, so be sure to check out all the new home builder information we have posted on the site. 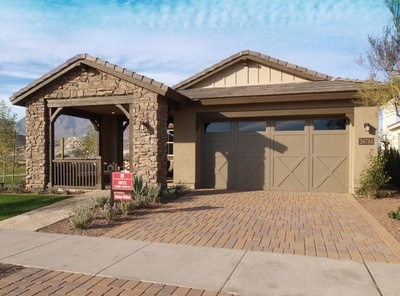 Victory at Verrado will offer a great trail system for the Active Adult Lifestyle. Residents will enjoy an astounding line-up of indoor and outdoor amenities at the planned Victory Club. It will offer over 35,000 square feet of indoor services as well as unique outdoor facilities. Slated to open in December 2015, the clubhouse will consist of an arts and crafts studio, a demonstration kitchen, multi-purpose classrooms, and on-site dining. It will also feature a day spa, state-of-the-art fitness center, and more. The Victory Club will have year-round, indoor and outdoor amenities. Residents and their guests will have access to a 25-yard lap pool, three resort-style pools, tennis and pickleball courts, and a yoga lawn. Victory’s amenities will also include a golf course, garden, event lawn, vineyard, olive grove and more. There will even be miles of trails that offer great hiking as well as scenic parks, with the first Avid Trails system. In addition, Victory is already delivering a great meeting place at The Patio, where you can gather for social functions and get a view of the new golf driving range, with the "HAVE FUN" sign up the hill; the new home of the community center that is currently under construction. If you are looking for more sun, lower property taxes, a great 55 plus community and a premier golf course, then you need look no further. Contact us below, and we'll keep you apprised as new information is released on this fabulous new community. The homes at Victory are being designed with unique features. The developer is working with a small group of the best builders to develop the smartest floor plans and coolest house designs. That means you’ll have more choices, better quality homes and more diverse neighborhood designs. Price Ranges - Base prices are planned to range from the low $200,000′s to more than $500,000, but depending on options and lot premiums are landing more in the upper mid 300's. Design Inspiration - Smart home designs with lifestyle in mind, along with emphasis on entertaining, open and casual living, outdoor living, personal retreats, gourmet kitchens, usable storage, energy efficiency, low maintenance, and opportunities for personalization. HOA Fees - add $66 to the standard Verrado dues of $126. Listing information last updated on April 23rd, 2019 at 3:47am PDT.